If you are a maker of the following: Art, Movies, Music, Love, and the anything in between, we would love to hear from you! This page is intended to serve the Underdog community. All Underdogs are encouraged to share news, invitations, and updates here. We will post your information here and throughout our network. 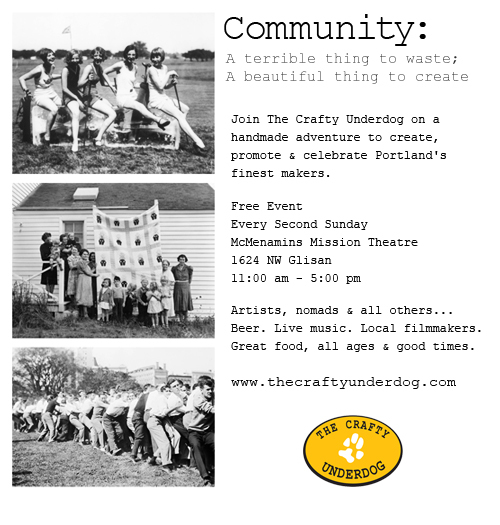 Please submit your photos, inspirations, ideas and sensations to craftyunderdog@gmail.com. Why aren’t the craft fairs advertised on the Mission Theaters webpage? Thanks for the head’s up Missy, I will call over there. Usually, we are up there every month for the 2nd Sunday, but this one is on the 1st so we confused them a bit.